Editors Note: Since Philadelphia is known as a city of neighborhoods, we asked Temple Law students, faculty, and staff to talk about what they love, hate, and can’t live without in their neighborhood. See every neighborhood covered thus far. During the first two years of law school I lived in Southwest Center City-the neighborhood straddling Rittenhouse and Graduate Hospital. While I loved its location, tree lined streets, and 5-minute walk to the Rittenhouse La Colombe, I had thoroughly explored all the dining options and was ready to reduce my rent check. I moved to Passyunk Square this spring and can’t believe I’ve missed out on all its glory for the past two years. While I had been to Passyunk Square a few times to try new restaurants, living and immersing myself in the neighborhood has been an entirely different experience. 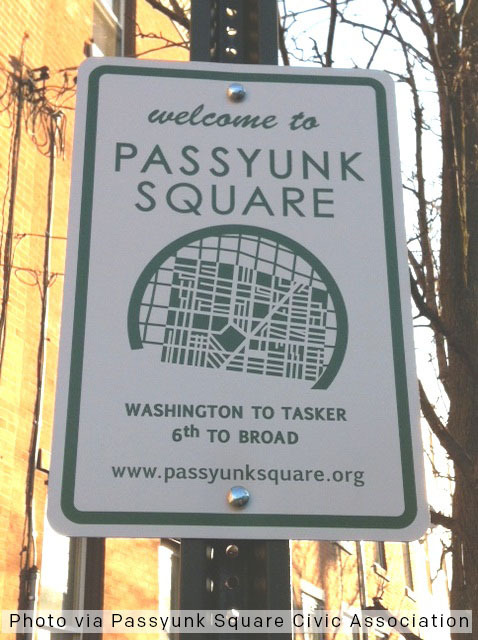 Passyunk Square is a neighborhood that stretches east from Broad Street to 6th St., and south from Washington Ave. to Tasker Street. 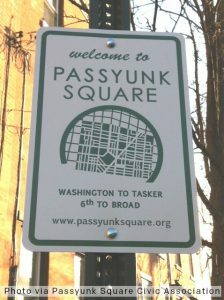 The neighborhood of East Passyunk Crossing is very similar, and extends down from Tasker to Synder Ave. The neighborhood hosts both the Tasker Morris and Ellsworth-Federal subway stations on the Broad Street Line, which makes Passyunk Square a convenient location for traveling to Temple. The neighborhood is home to dozens of Isaiah Zagar mosaic murals, which can be found on random corners and tucked away in alleys. The large bay windows found in many of the row homes become a spectacle around the holidays where residents adorn their homes with kitschy but charming decorations. 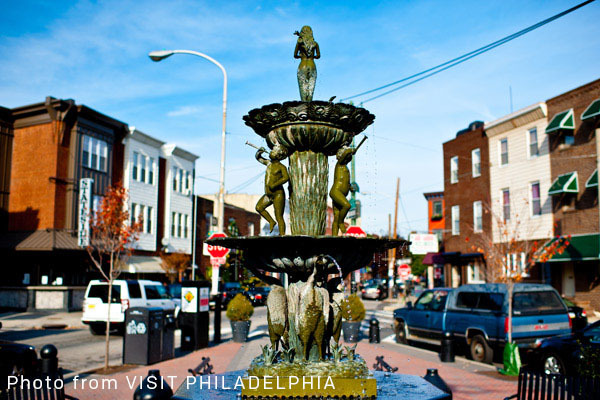 Basically, leisurely walks around Passyunk Square are never boring! Best thing: The restaurant scene. Worst thing: Only one grocery store. How I get to Temple: I switch between driving and taking the subway. Closest grocery store: ACME on Passyunk Ave.
Passyunk Square is a great neighborhood for so many reasons. Street parking spots are much more abundant, and the PPA is not nearly as vigilant so I spend much less time circling the blocks after returning from night classes. There are plenty of dining options that range in price and cuisine: from BYOB taquerias, to old-school Philadelphia-Italian, to trendy casual dim sum and expensive fine dining. This short list doesn’t even begin to cover the options found on Passyunk Ave. If you like to avoid the long lines and crowded dance floors of Center City bars, Passyunk Square is for you. Many pubs and casual bars line Passyunk Ave., from Garage across from Geno’s Steaks down to Stogie Joe’s. If IPAs aren’t your thing, there are nice cocktail and wine bars that scatter the neighborhood as well. Passyunk Square is home to a diverse community of residents. Walking down the Ave you may hear a family of Spanish speakers to your left and a group of older men arguing in Italian to your right. I live just blocks from both a Cambodian market, and an African Methodist Episcopal Church that was established in the 1930s. Though Passyunk Square isn’t immune to the gentrification taking place across Philadelphia, many of the families in the homes surrounding mine have lived there for decades and the row homes remain mostly undisturbed by new construction. There isn’t much I don’t like about the neighborhood. My biggest complaint is the lack of grocery store options. The ACME is very expensive and doesn’t always have the selection of produce that I am looking for. However, the neighborhood is just south of the Italian Market which offers a great variety of produce stands and poultry shops. Since I have a car, I often make the trip up to the Center City Trader Joe’s to save money. I love how Passyunk Square feels more like a neighborhood with character and culture and and less like a commercial metropolis, which is a major reason why I moved here. However, some benefits of living in a big city felt a little lost when I moved. For example, all of the major stores between Walnut and Chestnut Streets that were only a 10-minute walk from my last apartment now require a 20 to 30 minute trip (walk included) via subway. However, if you do have a car, the Columbus Blvd. shopping area is quite close to Passyunk Square and provides a similar convenience as the Walnut and Chestnut Street shopping district (i.e. your printer ran out of ink and you need to get to Staples ASAP). Overall, these “negatives” are far outweighed by the benefits of living in Passyunk Square. If you are looking for an affordable neighborhood that boasts the old-school charm of South Philadelphia (a 5-piece Italian band playing music next to a fountain on a Wednesday night) while still keeping up with the growing restaurant scene and nightlife of modern Philadelphia, Passyunk Square fits the bill.